Being Retro: Pay It Forward! ... I Give You Zombies! 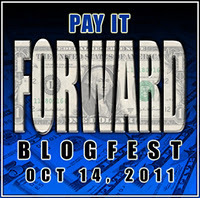 Matthew of QQQE and ALEX J. are proud to present the Pay it Forward Blogfest! We highlight three  of our sites that I love and thought you all should know... I want you all to go zombie, since we are so close to Halloween. Some you may know all ready and well here you go! Fresh onto the blog scene, but will make a huge impact. This site, is everything my site used to be, they are more focused. Special place in my heart, many great things to discover. Some great reviews and just a cool site. Wow! Thanks for the mention! I am checking out the other sites right now. You are the coolest dude I know, J. Thanks for taking part. My writing partner is a zombie fanatic and as we are editing her zombie work, I've grown a fondness for them. It's sort of like an extra appendage, but she assures me that so long as it doesn't start to fester for me not to worry about it. Thanks for the heads up. Love finding like minded bloggers to follow! !